The voters of Jackson and Josephine counties recognized the need for Rogue Community College to grow and passed a $20 million bond in 2016. 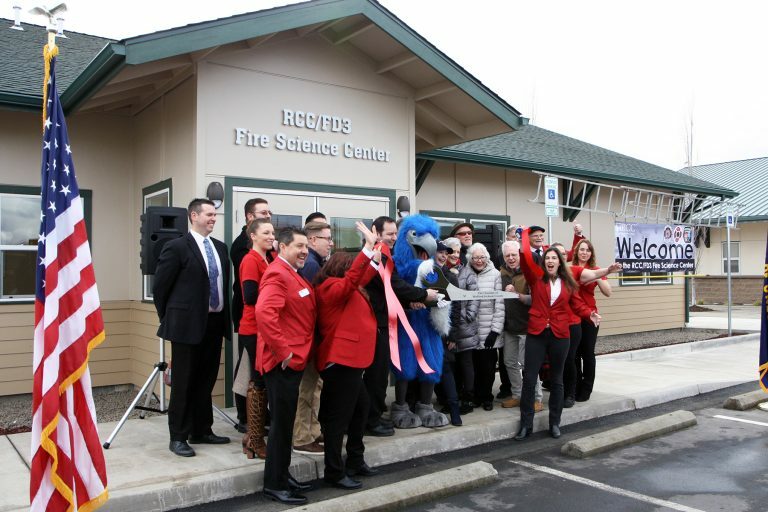 Thanks to their support, and the support of many others, RCC launched a new High Tech Center in 2018, a new Fire Science Center in early 2019, and is now underway with a new Health Professions Center on its Table Rock Campus in White City and a new art instruction center on its Redwood Campus in Grants Pass. RCC purchased a vacant factory building adjacent to its Table Rock Campus and through a massive $4.2 million reconstruction the 11,800-square-foot hulk was transformed into a glittering career technical training center. It is now the regional cornerstone for high technology training in manufacturing/engineering, welding, mechatronics and other advanced skills.Students began classes in the new facility on Monday, Sept. 24, 2018 after a big celebration with the business and education communities. Todd Geisbrecht, chair of the welding department, said local employers and other businesses as far away as California are looking high and low for skilled workers. “We have a shortage,” he added. “Employees are at a premium, and with the advent of this building more and more people see this as a resource for them to build their skill sets.”For example, there are Amatrol production line modules for training in developing and programming production lines. It teaches students how to program the machines and service any of the automated equipment in the valley. The High Tech Center was made possible by the voters of Jackson and Josephine counties when they passed a $20 million bond in 2016. Additional funding was provided by a U.S. Economic Development Administration grant, the Morris Family Foundation, the Meyer Memorial Trust, Boise Cascade, Bill Thorndike and Medford Fabrication, Mary and Ted Warrick, Patsy Smullin, Rough & Ready Lumber Company, Jackson County and other donations to the RCC Foundation from employees of Rogue Community College. After five months of construction, Rogue Community College and Jackson County Fire District No. 3 celebrated the grand opening of the RCC/FD3 Fire Science Center on Feb. 5, 2019. The $1 million joint project adds classroom and meeting space next to the FD3 administration building at 8383 Agate Road in White City. “We are excited to take this next step in improving fire science training in the Rogue Valley,” said Gary Heigel, chair of the RCC Emergency Services department. The 2,600-square-foot center provides classroom and office space for the RCC Fire Science program and serves as a centralized location for affiliated fire and public safety organizations to host local and regional trainings. The center’s two classrooms can be combined into one large meeting space accommodating up to 150 people. The new building is located on the southeast corner of the FD3 White City Campus, which includes a training center used by RCC fire science students and professional firefighters. “We are excited that our partnership brings added capacity to the emergency services program and we look forward to educating public safety providers throughout the region. We are thankful for the community support of this project and the vision of the RCC Board of Education, and the Fire District 3 Budget Committee and Board of Directors to enhance the regional training center,” stated FD3 Division Chief Dave Blakely. This collaborative effort between RCC and FD3 was envisioned and discussed for many years before the breaking ground in August 2018. The new building is a $1 million dollar investment between both partners. RCC allocated $500,000 from Bond 17.69, passed by voters in 2016; the Fire District 3 Budget Committee and Board of Directors allocated $500,000 from the District’s Capital Project Fund. FD3 also donated the land where the building is located. To schedule a class, meeting or conference in this facility, contact FD3 at 541-831-2715. A new art space is coming to Rogue Community College. When finished, the 6,246-square-foot facility will be a new home for art classes in Josephine County. The building will include three large, well-lit and ergonomically designed studio classroom spaces, a well-equipped computer lab and media center, a lobby and exhibit space, and two faculty offices. The shell of the building will be completely refitted, and the design will take full advantage of the natural light opportunities of the location. The painting, drawing, sculpture and design studios will have generous glass areas on the north and east faces, as is ideal for those media practices. Jewelry and metalsmithing will be taught in one of the classrooms. Brake noted that “the architects came up with a wonderfully attractive entrance design.” It will have a spacious awning – a practical consideration for students, who often must transport and protect large art projects in and out of the building – and an outdoor gathering and resting spot. It will be a welcoming space that serves as a destination and gathering place for RCC students. Contractor for the project is Adroit Construction. Set to open for classes in the fall of 2020, the RCC Health Professions Center will be a 35,648-square-foot teaching facility featuring the newest in health care training technology. The center will house all of the college’s clinical health care programs including the associate degree nursing (ADN) program, the signature health care degree at RCC, which boasts a 100-percent placement rate for graduates. For the first time in 30 years, the RCC nursing program will have new classrooms, a basic skills lab and a high-fidelity simulation lab. Other programs that will move into the new center are basic health care certification; dental assisting; dental hygiene; medical administrative assisting; medical assisting; medical coding specialist; pharmacy technician; phlebotomy; practical nursing (LPN); and sterile processing technician. “Rogue Community College continues to be grateful for the opportunity to provide our community members with academic programs that meet their educational needs while also meeting the employment needs of our industry partners,” said Teri Smith, dean of health and public service. “The Health Professions Center will be fully equipped with the latest technology and equipment allowing our students to be fully prepared to enter our local workforce. We are proud to have so many partners in bringing the vision of a regional health care training center to Southern Oregon, allowing us to expand opportunities for students that lead directly into living wage employment.” Architects for the project are Hennebery Eddy Architects and Kistler+Small+White. General contractor is Adroit Construction. Community College Workforce Development-Oregon Department of Administrative Service.